As the population of the United States ages, and as older adults remain in better health for a longer period of time, they travel more extensively and indulge in a variety of different outdoor avocations that are associated with increased risk of infection from endemic mycoses (19). Endemic mycoses are found in soil or vegetation; each has its own ecological niche from which it is aerosolized and subsequently inhaled (see Table 2). Older persons may become infected while traveling in an area endemic for a certain fungus, but symptoms may appear only after they return home. Thus, a patient who consults a physician in Minnesota with symptoms related to coccidioidomycosis that was acquired in southern California may be the first patient with this infection ever seen by that physician, and the correct diagnosis may not be made. Several of the endemic mycoses have the propensity to reactivate as immunity wanes because of increasing age or an intercurrent immunosuppressive condition. This reactivation event might occur in a person who retired to an area of the country outside of the endemic area for a particular fungal infection. Thus, although physicians in the southwestern United States are very familiar with coccidioidomycosis, histoplasmosis or blastomycosis might be overlooked in a patient from Kentucky who has retired to Arizona. Histoplasma capsulatum is endemic in the Mississippi and Ohio River valleys. It is estimated that hundreds of thousands of people are infected each year with H. capsulatum, but usually the illness is benign with minimal flulike symptoms. Histoplasmosis is the only endemic mycosis in which certain manifestations of the disease, specifically chronic cavitary pulmonary infection and progressive disseminated histoplasmosis, occur predominantly in older individuals (19). Blastomyces dermatitidis, the causative agent of blastomycosis, is found most frequently in the southeastern, south central, and north central United States. Although outbreaks have occurred in groups involved in outdoor activities, most often individual cases occur in patients for whom a specific point source of infection cannot be found. There is no evidence that older individuals are at more risk for developing blastomycosis than are younger persons. However, adult respiratory distress syndrome has been described more often in older individuals than in younger patients with blastomycosis (7). As the exodus of retirees to the southwestern United States continues, first-time exposure to Coccidioides immitis has increased in older adults. This organism proliferates in the deserts of Arizona and California that comprise the Lower Sonoran Life Zone, typified by flora, such as the saguaro cactus. The conidia are widely dispersed during windstorms, and thus C. immitis is highly contagious. tion and diabetes mellitus, which is more common in older adults. Dark-skinned races are more likely to experience disseminated infection than whites for reasons that are not clear. Two forms of histoplasmosis are seen most often in older adults (see Table 2). 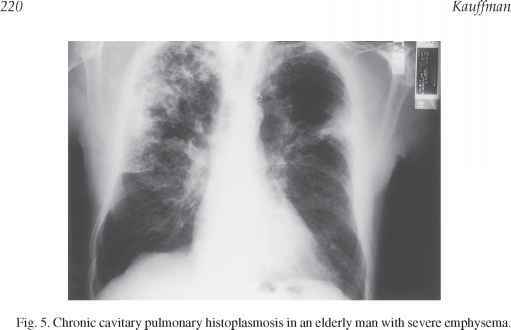 Chronic cavitary pulmonary histoplasmosis affects mostly middle-aged and elderly men who have emphysema (19). Patients with this form of histoplasmosis have constitutional symptoms of fatigue, weakness, fever, night sweats, and weight loss. 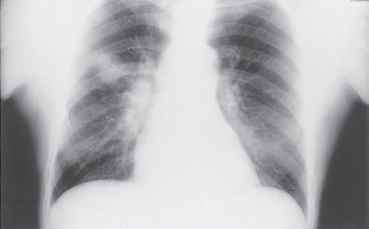 Pulmonary symptoms include dyspnea, cough, sputum production, and hemoptysis. The disease is subacute to chronic in its course. Upper lobe cavitary disease is the usual chest radiographic finding (see Fig. 5). Progressive scarring, pulmonary insufficiency, and death occur unless treatment is given. Fig. 6. Pulmonary blastomycosis initially thought to be lung cancer. Bronchoscopy with biopsy showed granulomas and thick-walled budding yeasts typical of B. dermatitidis. loss, and fatigue. When the pulmonary lesions are predominantly nodular or mass-like, the initial diagnosis is often carcinoma of the lung (see Fig. 6). Although blastomycosis begins in the lungs, subsequent dissemination to other organs is common; frequently, the only clinical symptom is the development of one or multiple skin lesions that are usually slowly enlarging, verrucous, and crusting with discrete areas of purulence (see Fig. 7). Spread to bone or to the GU tract gives rise to manifestations reflecting involvement of those organs. Coccidioidomycosis may present in many different ways (see Table 2). Patients experiencing primary disease usually have a flu-like illness consisting of fever, cough, headache, and fatigue. 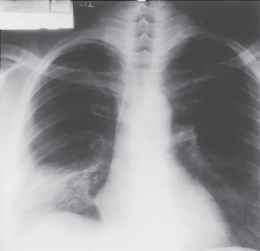 Chronic pulmonary coccidioidomycosis may give nodular or cavitary lesions, progressive pneumonia, or diffuse miliary infiltrates on chest radiograph (see Fig. 8). The most frequently involved organs with disseminated coccidioidomycosis are skin, bone, GU tract, and meninges. Meningitis, the most feared complication, presents with chronic headache months after the initial infection. Diagnosis of the endemic mycoses can be made using several different diagnostic methods: cultures obtained from the infected tissue; histopathologic or cytologic examination of tissue, body fluids, or purulent material; and serologic assays for antibodies. Fig. 7. Typical indolent verrucous skin lesions of blastomycosis on the hands and legs of an elderly gentleman (photo courtesy of Dr. Gunner Deery). The most definitive method of diagnosis is growth of the organism, but for histoplasmosis and blastomycosis, culture requires special media and growth may take 4-6 wk. C. immitis grows on fungal or regular media within several days usually. Because C. immitis is highly contagious in the laboratory setting, clinicians must inform the laboratory that coccidioidomycosis is a possibility so that precautions can be taken. Histopathologic or cytologic demonstration of the organism in tissues or body fluids is extremely helpful for diagnosis, especially for those patients who are acutely ill. The typical thick-walled yeasts of B. dermatitidis, showing single broad-based buds, are readily identified in cytological or potassium hydroxide preparations of sputum or synovial fluid and histopathological examination of tissue biopsies. The tiny intracellular yeast forms of H. capsulatum are best visualized in tissues using methenamine silver stains and in bone marrow and other tissue aspirates using Giemsa stain. C. immitis is quite distinctive in tissues. The large spherules (80-100 ^m) can be seen in tissue sections and in purulent drainage. Serology plays an important role in the diagnosis of histoplasmosis and coccidioidomycosis. A positive test prompts the clinician to consider more invasive procedures, such as bronchoscopy or bone marrow and liver biopsies, to establish a diagnosis. There are occasions when the only evidence for infection is the presence of antibodies; this is especially true of meningitis, in which the fungus is exceedingly difficult to grow but CSF serology is positive. For blastomycosis, specific and sensitive serologic assays are not commercially available. Fig. 8. Right upper lobe pneumonia due to C. immitis in a marine sent to southern California for training. both androgenic and corticosteroid hormones, causing decreased libido and gynecomastia and, rarely, Addison's disease. Itraconazole does not have these effects when given at recommended doses but does cause edema, hypokalemia, and hypertension in a small percentage of patients. All of the azole agents have been noted to cause hepatitis in a small number of patients. Absorption of ketoconazole and itraconazole is dependent on gastric acidity. Because older adults are more likely to be achlorhydric, absorption may be decreased. Histamine (H2) receptor antagonists, proton pump inhibitors, and antacids should not be used when itraconazole or ketoconazole are prescribed. Itraconazole also requires administration with food to enhance absorption. Fluconazole requires neither gastric acidity nor food for absorption. Drug interactions, many of which have serious implications for older adults, are frequently encountered with the azole antifungal drugs. Interactions with warfarin, phenytoin, and carbamazepine occur in varying degrees with all of the azole drugs in current use. Itraconazole can increase serum digoxin levels with subsequent toxicity, and ketoconazole and fluconazole can increase the effect of oral hypoglycemics. The antihistamine astemizole and the motility drug cisapride should never be used concurrently with azoles because of QT prolongation and ventricular arrhythmias. In spite of these issues, the azoles are exceedingly useful in older adults with endemic mycoses. Most therapy is now given in the outpatient setting. Itraconazole is the preferred agent because of its greater intrinsic activity against the endemic mycoses when compared with fluconazole and better tolerability when compared with ketoconazole. 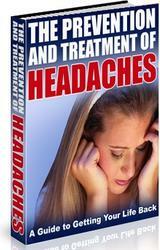 The usual dosage is 200 mg once or twice a day given with food to enhance absorption. Depending on the fungal infection, therapy is given for 6-12 mo and sometimes longer. For those patients who develop coccidioidal meningitis, fluconazole is preferred because of its superior CSF penetration. The dosage is 800 mg daily with normal renal function, and therapy must be given for life, as the organism is rarely eradicated from the central nervous system (23). Overall, results with therapy for the endemic mycoses are excellent, although older patients with advanced emphysema and cavitary histoplasmosis rarely return to their prior functional state and those with coccidioidal meningitis often have a protracted course with a poor outcome. What is endemic to aged patients?